Also, I will show how you can create a trial of Azure account. So let’s first create a trial of Microsoft Azure. 2. Click on Start Free button. 3. Now read the details. And again click on start free button. 4. Log in with your Microsoft Account. 5. Once logged in, you have to fill the personal details along with your credit card details. Microsoft will charge a very nominal amount, in my case, it was 2.00 INR for the trial account. Now once everything is done your Azure dashboard will appear. Once your Azure azzount is ready, now you can create new resources like SQL Database, Load Balancer, Storage, Apps etc. If you have worked on Microsoft technologies like SharePoint or ASP.net then you must have used SQL. So let’s first create a SQL Database in Azure. Click on SQL Database from left side panel. In Server Configuration, enter below details. Server name, admin login, password, select location and click on Select button from server configuration column. Leave rest thing as default and click on create. You may see Deployment is in progress, it might take few minutes to finish this. Now it's time to write some basic SQL Query. Click on Tools. Select Query Editor and log in with your SQL DB credentials. Paste your query in the editor and click on run. Once executed you can see the result in the bottom of the query editor. In my case, I have used a SQL script to create a table called User and insert 2 records. 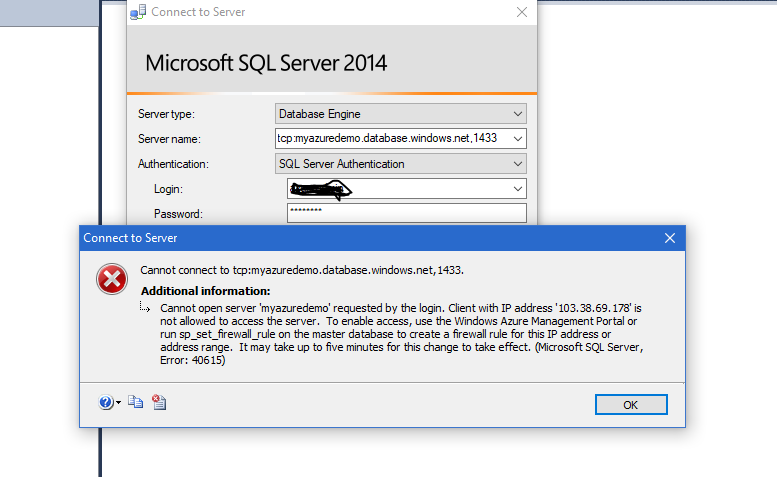 You may connect this Database from your local SQL Server Management Studio, to connect this you must allow your ip to access this. If not allowed you may see below error. 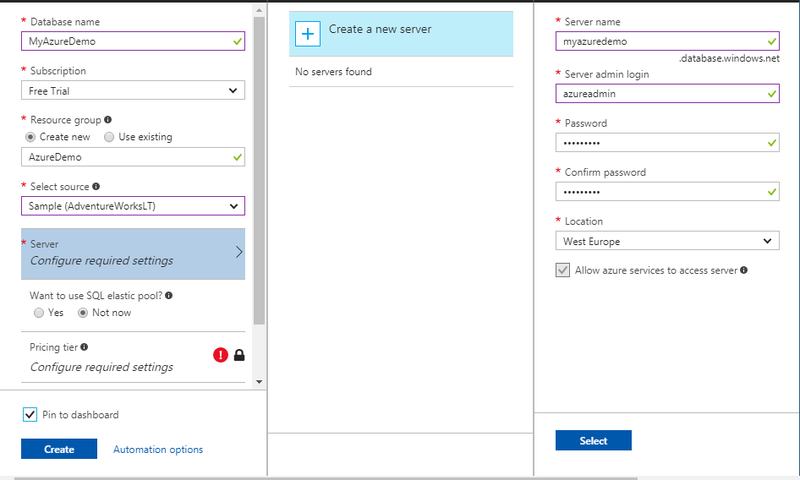 Similarly, you can create any new resource in Azure Portal. Suppose you want to create DevTest Labs Tool which comes under Developer Tools. So Till now, you are able to create a new resource. As my blog is based on development experience so I will discuss Developer Tools available in the Azure portal. DevTest Labs - It helps development and testing team to create VM in just a few click on Azure to deploy and test the applications. Is the website available all the time? Is the user experience responsive and usable? Hope you are ok with the introduction with Azure Dashboard. 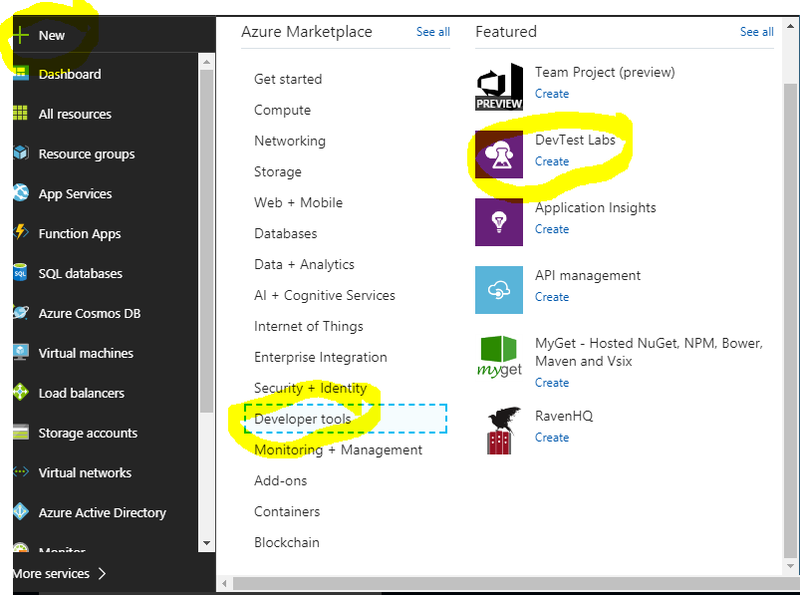 In upcoming blogs, I will share my deployment and other developer tools experience in the Azure Portal.